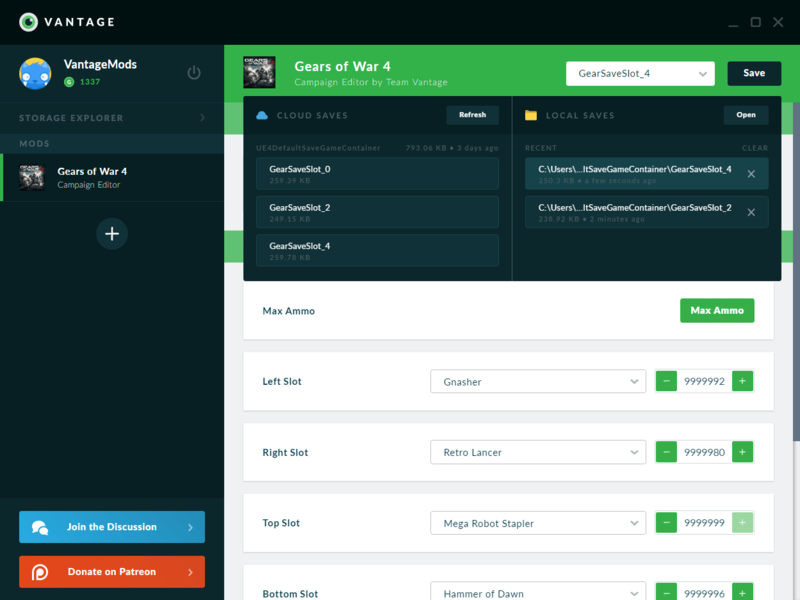 The first Xbox One game save modding tool is finally out. After months of research and development we're glad to give you the first taste of what it's like to mod games on your Xbox One. Allows editors to use node's native crypto and zlib modules. Fixed all known issues (namely the wrong editor being opened). An update was release to fix an issue where game saves would not always display requiring Vantage to be closed and reopened. - Added option to cancel save loading after 10 seconds. - Added ability to load local saves while cloud saves are refreshing. - Fixed recent local save history disappearing. - Fixed loading of editors installed from tagged GitHub releases. - Fixed window loading off screen. - Upgraded Electron and other dependencies. - All future releases will be for 64-bit Windows. If you have 32-bit, shame on you. - Access your saved game files without a flash drive! FOR EXAMPLE SRRY MY CAPS LOCK IS ON IM NOT ANGRY IM JUST SAYING. Espanol (Spanish): No deja meter mi cuenta, solo entra a la interfaz y aparece el gears of war 4 pero no me deja modificar nada. Ingles (English): It doesnt let me enter my account, it only enters the interface and the gears of war 4 appears but it does not let me modify anything. Does anyone know where to find the savegames for gears of war 4 on pc because i can't find them. help would be great. Qualcuno potrebbe spiegarmi i passaggi da seguire per installare l'applicazione? Scarico il file zip ma quando cerco di eseguirlo, compare un messaggio di errore che afferma che non ho le autorizzazioni per avviarlo. Grazie per qualsiasi risposta. Do you guys think there will be mods for up coming games such as Red Dead and BF5?